Remodeling or renovating your kitchen isn’t always as easy as you expect it will be. Remodeling or renovating your kitchen isn’t always as easy as you expect it will be. However, when you do it a certain way, you can make sure that your beautiful kitchen never goes out of style and remains beautiful for years to come. The Cabinets: When you are picking the cabinets, keep it simple. 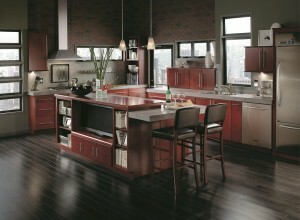 For instance, choose Shaker cabinets. They look great and are trendy enough to fit in with modern tastes while still reflecting a timeless sensibility. No matter what aesthetic you’re planning for your newly-remodeling kitchen, you can’t overlook the design of the cabinets. The Sinks: Next, you’ll have to select a new sink that will look just as good in five years as it does five weeks from now. Consider adding a farmhouse sink, as these are deep enough to fit all types of dishes and won’t wear down easily. They are also elegant additions to your remodeled kitchen that will impress your neighbors. The Counters: Marble and quartz have long been two of the most popular materials for countertops. Select one or the other – and don’t hesitate to have both! For instance, the original countertop in your kitchen could be redone in marble, while you add the island and make it quartz. The Appliances: If your old appliances aren’t working as well as they once did, then it might be time to replace them. Advancements in technology have made every appliance you can think of more efficient – whether it is a dishwasher that will sense when it is full and automatically start the cycle or a refrigerator with a built-in webcam – these features are cutting edge. Beadboard: Although you might be wary of adding more wooden elements to your new kitchen, beadboard is a good idea. It sounds old-fashioned, but these beadboard panels will fit your new kitchen and protect it from various food and drink spills. Neutral colors: Neutral colors, like earthy tones, shades of white, and splashes of silver will make your kitchen a relaxing place to be even in the hustle and bustle of the holidays. Open floor plans: You can also choose open floor plans for your kitchen. Doing this will make it easier to move around in your kitchen and help speed up the cooking process. Capital Remodeling is ready to transform and beautify your kitchen in Maryland, Northern Virginia, and Washington DC this fall and winter with affordable kitchen remodeling that will exceed your expectations. With our quality kitchen remodeling services, reasonable prices, and flawless customer service, you will love the results. If you’re ready for a free quote, visit us online or give us a call at 1-844-320-9847. If you’d like to see our previous projects, follow us on Facebook, Pinterest, Houzz, Twitter, Google+, LinkedIn, and YouTube. This entry was posted on Tuesday, November 20th, 2018	at 11:36 AM	and is filed under Kitchens	. You can follow any responses to this entry through the RSS 2.0	feed. Both comments and pings are currently closed.